Offer birds a small feeding station with this Gardman Compact Feeder Tray. 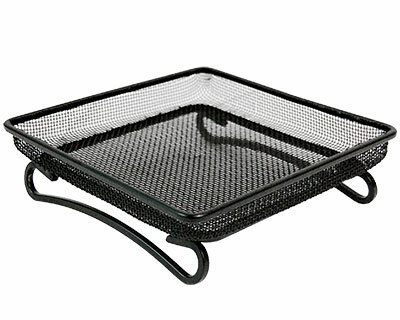 This black, mesh tray holds fruit, seed, mealworms, or suet for the feeding delight of your birds. The micro mesh allows water to drain, while keeping seed fresh and reducing seed waste. Two molded black legs rest on two sides of the feeder, elevating the unit off of the ground or your deck. The tray holds 0.5 quarts of seed or other feed, and its small size allows it to be placed virtually anywhere. The metal construction will last for several seasons, while the black color adds a timeless look. Offer additional feed to different types of birds with this Compact Feeder Tray.